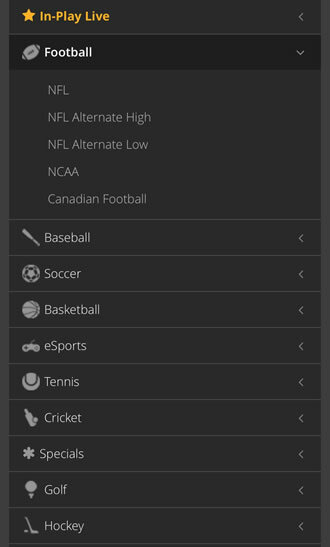 Nitrogen Sports is the #1 bitcoin sports betting app. U.S. Citizens Accepted. 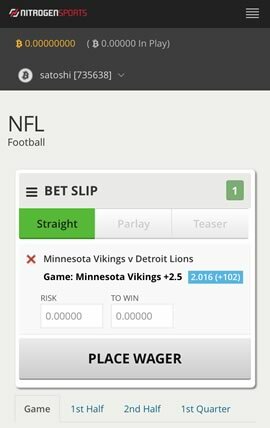 Bet live or in-play with bitcoin on the NFL, EPL, MBA, NHL and most other sports. Create a completely anonymous sportsbook account in seconds. Total privacy. 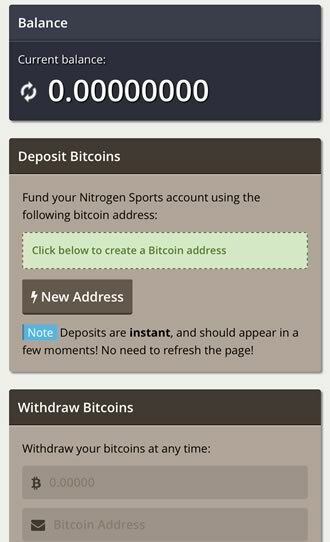 Founded in 2012, Nitrogen Sports is a bitcoin-exclusive sportsbook based out of Costa Rica. Because Nitrogen Sports is the most popular bitcoin-only sportsbook, it doesn't suffer from a lack of liquidity in sports betting markets like many of its smaller competitors. ​In major gambling markets like the NFL, NBA and English Premier League, you will often find that the betting lines are better than those offered by traditional bookies like 5Dimes, BetOnline and Bovada. While a bitcoin only model might not be what some players are looking for, those who are looking to use bitcoin to fund their mobile sports betting will find a sportsbook with a strong selection of betting markets as well as a relatively hassle-free experience with regards to deposits and withdrawals, something that isn't always guaranteed for American sports bettors using American currency. From a design perspective, Nitrogen Sports looks clean and offers a mobile experience that looks identical to its desktop experience. Betting markets are easy to find for the most part along the left hand side of the user's screen, but some sports can be a little convoluted to find what you are looking for. Tennis, for example, is a sport where there are tournaments happening at multiple sites each day, and Nitrogen Sports breaks up its tennis markets by tournament, rather than allowing users to simply sort by men's and women's tennis. This can be inconvenient, but their Starting Soon feature makes up for it by letting bettors see matches with start times closest to the current time. Overall, this is a pleasant iPhone sports betting experience. Markets are organized nicely, with popular sports such as football and basketball near the top, keeping users from having to scroll through an unending alphabetically sorted list to find what they are looking for, so long as what they are looking for is in a higher demand than its alternatives. Adding additional wagers to a betslip shows instant updates to parlay odds, rather than having to wait to enter a wager amount to see what your parlay could yield, which is extremely helpful in getting a parlay together quickly. Bet limits at Nitrogen Sports are flexible depending on the sport you are wagering on, aside from a constant minimum bet of .001 BTC, which is valued at somewhere in the neighborhood of $0.70 depending on fluctuations in the bitcoin to US Dollar exchange rate. Maximum bets are much more fluid at Nitrogen Sports, with NFL games and other high profile events seeing maximums over 60 BTC, valued in the tens of thousands of dollars, while lower tier markets such as eSports are capped at numbers like .12 BTC, or less than $100. A fair criticism of Nitrogen Sports centers around its relative lack of live betting and futures betting compared to other sportsbooks. Nitrogen Sports offers live odds during select NFL, college football, MLB, and NBA games, but these offerings are not comprehensive and may not cover the game you want to wager on in those leagues, let alone sports like tennis and soccer which are not represented. Futures betting is scarce, with the occasional opportunity to bet on championship winners ahead of time. A lack of ability to bet on other fun futures markets such as win totals or most valuable player awards is upsetting as well. What they lack in prop betting and futures betting, Nitrogen Sports makes up for in its casino, offering poker and casino games to its players. Their casino appears to be small, only offering three forms of blackjack (one, two, and eight deck), as well as a dice game that allows players to bet on whether they'll roll over or under a value. This is better than nothing, if nothing to write home about. Maybe the best thing about Nitrogen Sports is just how easy it is to deposit and withdraw funds with their cashier. One confirmation is required for a deposit to be successful, but those deposits are nearly instant and allow users to start betting in a timely fashion. Withdrawals under 1 BTC require just one confirmation, while larger withdrawals requiring two or more, depending on the size of the payout. Adding to the convenience of Nitrogen Sports' cashier is that there are no fees associated with deposits or withdrawals. Mobile sports bettors who have used sportsbooks that aren't bitcoin-specific know the pain of having some amount taken out of your deposit in the form of fees, and then a larger amount taken out of withdrawals. That double whammy simply does not exist at Nitrogen Sports, making an already less painful process than depositing at traditional sportsbooks even more pleasant. Support at Nitrogen Sports is unconventional, yet still helpful. They offer a ticketing system on their website that asks users to fill out two fields to help them understand what your issue is and where within the site it occurred. There are also options to email their support team, as well as a chat at the top of the screen within the sportsbook, which administrators lurk in and respond to inquiries for help when needed. All of these options have been lauded for a quick turnaround time, often within a half hour of the initial inquiry. Nitrogen Sports does offer two-factor authentication, which can be adjusted in the account settings tab after logging in. 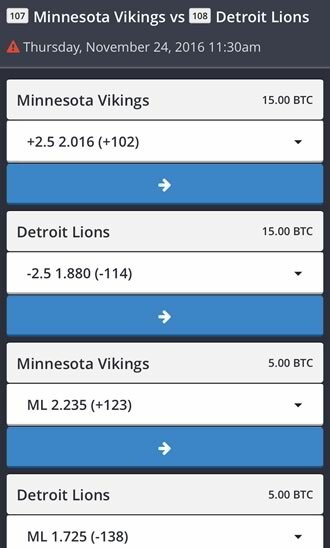 Promotions at Nitrogen Sports are scarce, as they are at most bitcoin-only sportsbooks, but they do have some unique offerings nonetheless. A monthly parlay jackpot puts portions of all parlay bets that meet a list of requirements into a pool, where prizes are awarded proportionally depending on the size of the player's parlay wager. They also offer iPhone sports bettors a chance to win free bets within their on-screen chat for successfully guessing the outcome of in-game props issued by chat administrators. This is a fun way to keep players engaged with the site even after their bets have been placed. 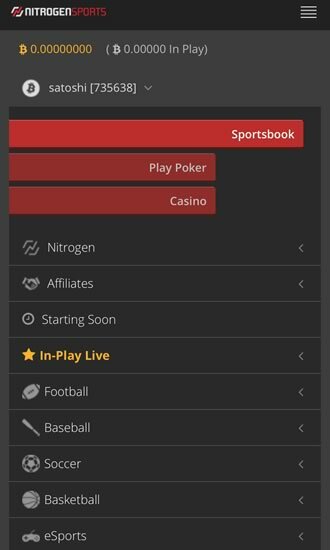 While they are by no means reinventing the wheel with regards to betting markets, Nitrogen Sports is a strong sportsbook with fast and free deposits and payouts. They have developed a quality mobile sports betting application that puts the efforts of bigger names like 5Dimes and BetOnline to shame.